Home Crowd Funded It’s like a ring of fire! It’s like a ring of fire! Unlike the one that Johnny Cash sang about, though, this one shouldn’t burn you. 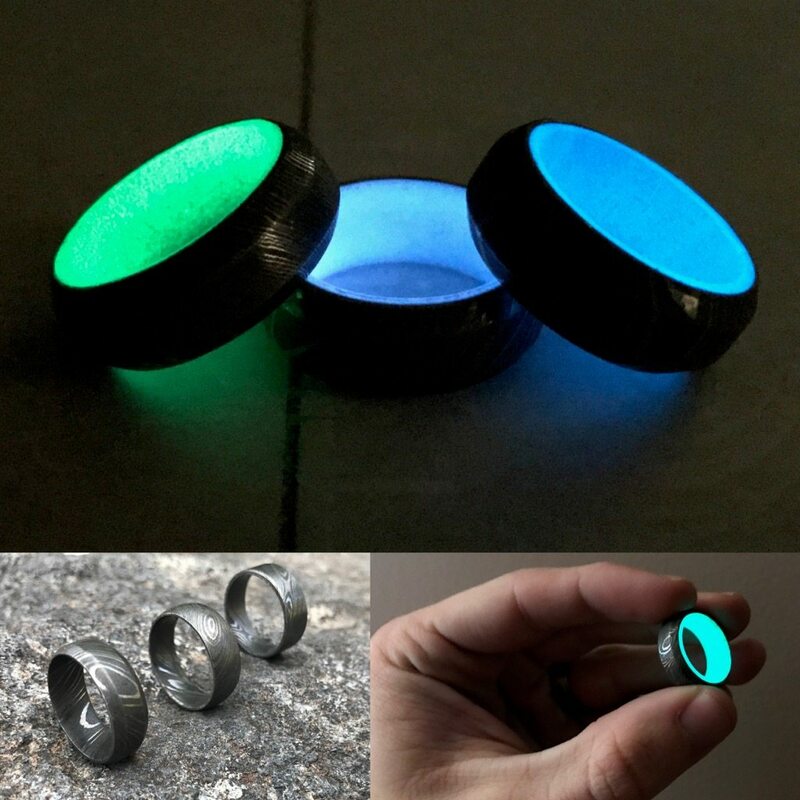 Rings with luminous material have been pretty popular as of late, and I’ve been interested in them ever since I ran across Black Badger a few years ago. I have also rather been a fan of the patterns inherent in damascus steel (evidenced by my writings on GoS watches), so it was a keen interest I took when I ran across a new Kickstarter project for a new ring, the Forged Illumination Nova. Now, if you are familiar with rings that have luminous materials (in terms of what is out there now), you know that pricing generally starts somewhere in the $300 – $500 range. When you start adding in a material that is a bit more exotic (as I’ll classify the damascus-patterned steel used here), one would expect the pricing to jump a good bit higher. Fortunately for you and me, the Forged Illumination Nova falls squarely in the affordable bucket, with earlybird pricing starting at $50 for a plain damascus ring, or $60 for one with the glowing insert. How is it that they can offer a ring like this at those prices? The Kickstarter page states that they have figured out a more economical – and efficient – way of manufacturing the rings. This is something that I asked the guy behind the project – Carl English – about. Turns out, this has come about due to a good working relationship with a local forge, supplying the raw materials, and actually taking a part in the forging process. Given that hands-on approach, you might presume that English has a background in manufacturing, but that isn’t the case. He previously owned a commercial and residential remodeling company, where he picked up an appreciation for working with his hands. So, why a pivot to making rings? English had been making rings with his son before, and feels that they’re a perfect way to make your own personal statement. As to incorporating the glowing aspect, English points to the Black Badger carbon fiber Portal series as the inspiration for how he (English) has designed the glow in the Forged Illumination Nova. At the start of the project, there were three planned colors for the lume on the Forged Illumination Nova – green, aqua, and blue, though stretch goals will add some other choices into the mix. In fact, one of the newer colors planned is a white glow (with some other colors under consideration). Another stretch goal will be to offer a 4mm wide option, as opposed to the 8mm that the Forged Illumination Nova is at. Finally, there’s the potential for some different damascus patterns showing up, depending on the campaign’s success.